What is Pursuing Music Career? What is pursuing music career? It is finding your own place in this world, where you can enjoy what you do and share your passion and talent to make this a better place for everyone. This is what I tell my students: "There is certainly a place for each one of you, and you are all desperately needed." My iPad has completely replaced my laptop since many years ago. The Belkin bluetooth keyboard/case makes it possible for me to do some heavy duty work on this iPad. I recently started carrying my Kindle again and am amazed how easy it is to read on it. I also started reading the addictive Murakami and brought a physical copy just in case. Finally, the leather tray helps me not to leave any valuables behind when I check in and out of different places. A scarf and UGG's wool sleepers keep me warm as the weather begins to cool down. 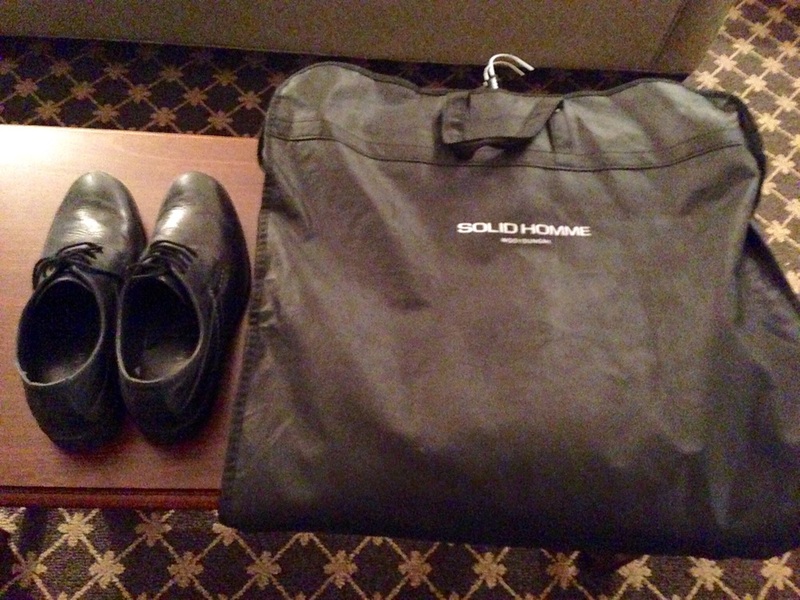 A concert attire and pair of black shoes are the must when traveling for concerts. I don't usually carry this much food with me. Granola mix and mixed nuts are easy easy to travel with. Apples supplement some much needed vitamins (I picked up several more from Atlanta's Delta Skyclub lounge). This time I also brought couple of Shin Noodle Bowl and a water boiler! Next time, I will post a blog entitled "What's in Your Clarinet Case?" My own Buffet Artist poster! I am excited to announce that for the first time in my career, I officially became an "artist" of some sort! Partnering with Buffet Group USA, the North American Division of the famous Buffet-Crampon Paris, I am invited to join a handful of remarkable clarinetists and colleagues in the company's artist roster. It is a great privilege to be associated with this prestigious company dating back to 1825. 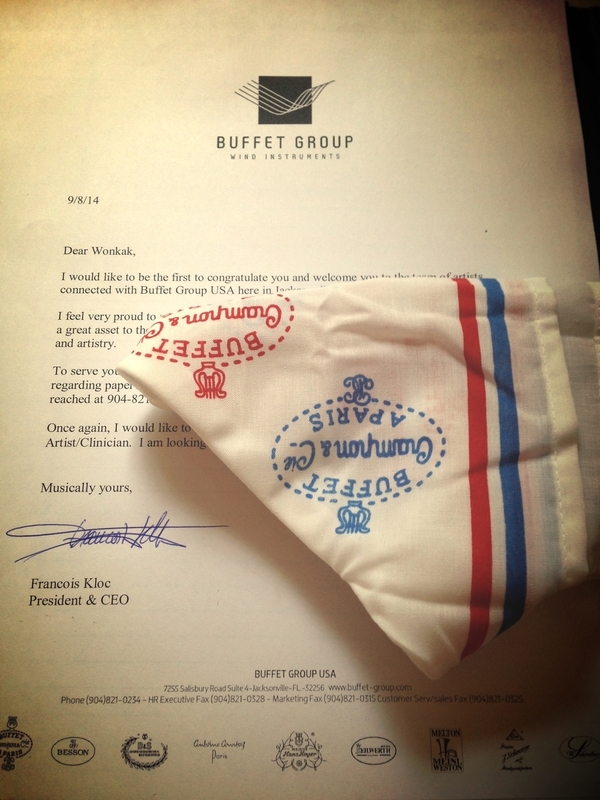 A letter from the CEO of Buffet Group USA (and the good old Buffet swap) - some more goodies came in, and the pictures are posted below. 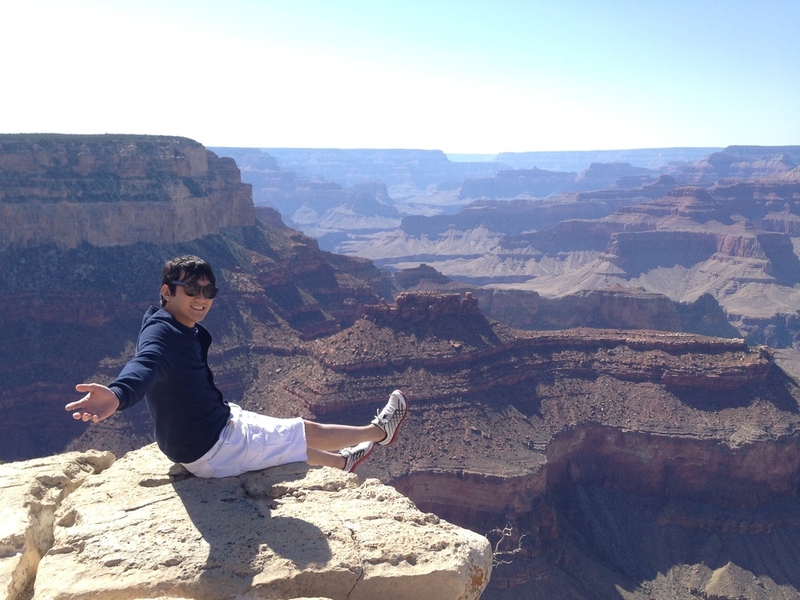 When I came to the US with my family, I started playing in a public high school band program with great enthusiasm. I soon met my first teacher, Ken Lee, renowned for his successful private studio in Northern Virginia. With the clarinet becoming increasingly important part of my life, we both agreed that I needed a professional level instrument. Under Lee's guidance, I ended up getting a Buffet Festival and soon purchased an A clarinet, too (also Festival). Those remarkable horns made it so easy for me to explore clarinet's incredible range of dynamic and color and helped me to discover my life-long passion for music. While it took many more years until I decided to pursue a musical career, they certainly provided the foundation for my future path. When I came to the UNC-Chapel Hill as a Freshman, one of the first things that my teacher Donald Oehler did for me was to draw the "Clarinet Family Tree" (shown above). Oehler explained that our modern clarinet came into existence as a result of the collaboration among Theobald Boehm, Hyacinth Klosé, and Louis-Auguste Buffet. We (like the vast majority of American clarinetists) use the "Boehm" system, study Klosé's Méthod, and play Buffet clarinets everyday (Ironically Oehler plays Selmer clarinets). This left me with a deep impression, and my faith in Buffet's legacy and instruments was permanently engraved. "This invention does not consist only of the addition of rings but also of the manner and orderliness of the design, for a small change is enough to create an instrument that is superior to the old one, but it would still be inferior to mine." I now play exclusively on one of Buffet's newest inventions, Tosca Green Line. I purchased the set while at graduate school studying with Frank Kowalsky. At certain point, I knew this is what I really wanted to do, and I spontaneously drove to Jacksonville Buffet Factory to choose my new instruments out of about 15 pairs. The improved key work, intonation, and durable material base makes the instrument an ideal companion for my daily musical adventures. I feel completely dependable and feel a degree of pride in carrying out this great tradition since the time of Buffet and Klosé. I host the Clarinet Day at Tech each year with a strong presence from Buffet Group USA. Among pictured above are my former teacher Donald Oehler, Buffet Southeast Representative Donnie Todd, and the fellow Buffet Artist Todd Waldecker.